It was June 20, 1953 when the Scotiadoc made the fatal mistake of turning across the path of the incoming Burlington to take the northern route to the Soo. He was downbound departing Thunder Bay, Ontario. The Burlington was upbound and their paths crossed in the open lake just off Trowbridge Island. One could tell the Scotiadoc was a ship of the Paterson & Sons Lines since all Paterson Lines ships had names ending in “doc” like Quedoc and Prindoc. The “doc” stood for the Dominion of Canada. The Scotiadoc was an old ship by modern standards, built in 1904 the 424 foot freighter had a full load of wheat on that foggy and windy day. Winds were from the northeast blowing 35 mph which in Lakes terminology is a gale force wind. It was post WWII USA and both ships had the benefit of radar so there was really no good reason the collision should have happened, but it did. Each ship saw the other on radar, but neither captain made an attempt to confirm his course over the radio to the other ship. Instead, in an all too late attempt to maneuver his ship out of the path of the Burlington, Captain George Edgar Morris of the Scotiadoc gave the command to turn hard to port. The Burlington, which was cruising too fast for the conditions, hit the Scotiadoc just forward of the stern cabins with a glancing blow then scrapped along the side of the Scotiadoc until he slid off the stern. 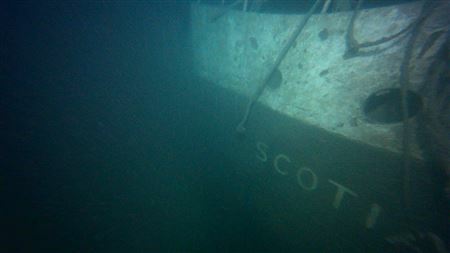 Scotiadoc name on shipwreck's bow at 850 feet deep. The Scotiadoc had a large gash in its side and water poured into its holds faster than the pumps could handle. The captain gave the order to stop engines and abandon ship for the lifeboats. By this time the Burlington was out of sight so there was no ship waiting to pick them up. All of the crew managed to get to the life boats, but one crew member fell out of the lifeboat as it was launched when a chain block gave way. The account says that he was quickly carried away. The crew was eventually picked up by the Burlington and taken back to Thunder Bay. 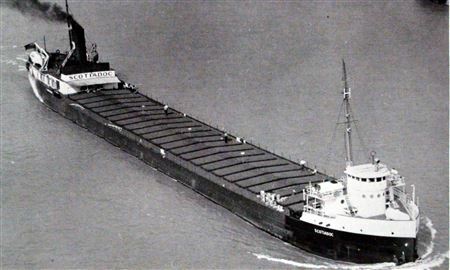 Another ship, the Keewatin passed by the area and witnessed the barely floating Scotiadoc , which one would assume would be close to the sinking time of the Scotiadoc. Captain Mitchell of the Keewatin dutifully recorded the time and estimated latitude and longitude of the distressed ship as he passed by. Jump ahead a month now to the inquiry where two possibly negligent captains had to testify to the facts of that day in a way that would not incriminate them to a point where they might lose their licenses and careers on the Great Lakes. For a shipwreck hunter this inquiry report is the best source of information on what happened that day, which hopefully would shed light on where the hull of the Scotiadoc eventually settled to the bottom. For the shipwreck hunters Jerry Eliason, Kraig Smith, and Ken Merryman, it is extremely rare that they ever got latitude and longitude for a sinking. Even if it was only somewhat accurate, it would be far better information than they ever had for any other ship they had hunted. Even with the information from the inquiry it still took eleven years of intermittent search trips to find the final resting place of the Scotiadoc. 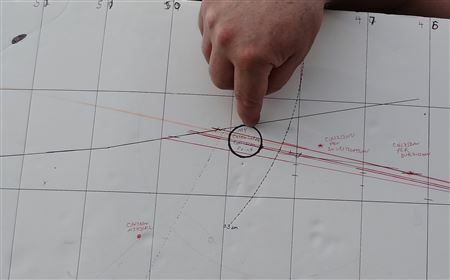 Chart showing the possible collision locations and Keewatin sighting locations off Trowbridge Island. The stories from the inquiry were consistent. The Burlington supposedly slowed down as would be prudent in the conditions, but did he really slow down? If he did it would affect the location of the collision and the ultimate location of the wreck. Was the crew member that fell out of the Scotiadoc lifeboat really swept away or did the Scotiadoc momentum just carry the ship away from the victim. Each answer to a question could move the location of the wreck. Finally how accurate was the latitude and longitude the captain of the Kewatin gave for his position as he witness the sinking ship. There was no Loran or GPS in those days and all positions were estimates based on dead reckoning. Scotiadoc search team L to R Jerry Eliason, Ken Merryman, Kraig Smith, cranking the camera up with the new Heyboy davit. As all shipwreck searches go, the team makes conclusions on likely answers to these questions and based on those assumptions picks an area to search. When that set of conclusions fails to show results, the next likely set of conclusions are tried until by process of eliminations the mystery or puzzle hopefully gets solved. The Scotiadoc search had expanded well beyond the likely bounds the historical data indicated. For the Scotiadoc however there was another factor that complicated the search. The team had never searched in 400’ to 900’ of water with the sonar. They were unsure how identifiable the wreck image would be at those depths. Also the lake bottom off Trowbridge Island is a maze of ledges, and rugged outcroppings which complicate the sonar images and masks potential targets. To verify a target they typically drop a tethered video camera onto the target. For two aging shipwreck hunters the idea of hand-over-hand hauling a forty pound camera plus cable up from almost 900 feet of water demanded a definitive target before they took on that daunting task. After discovering the Henry B. Smith in 530 feet of water it became apparent that the only way of managing the camera and cable at those depths was to build a some kind of winch and davit system for the search vessel Heyboy. After the 2013 modifications for adding a walk-through transom door on the Heyboy the davit system was a simple addition to the modifications. Armed with the new capability in July 2013 the team returned to check out a medium rated target that had been recorded years before. Accompanied by BuzzFeed reporter Katie Heaney, to their surprise on the first pass over the site the camera revealed the hull of a steel freighter – cargo hatch after cargo hatch. Unfortunately that is all they had time to record on the first trip and had to return two more times in 2013 and once in 2014 to collect enough video to positively identify the Scotiadoc and make an interesting presentation on the wreck for the Gales of November show in Duluth this year. 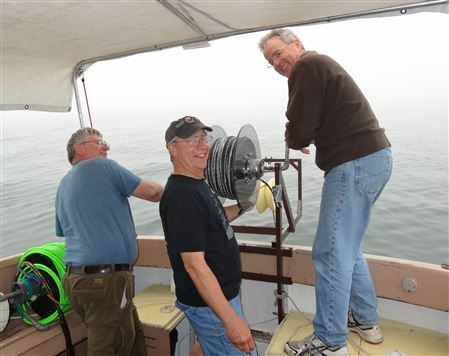 With help cranking the winch from Professor Bob Nelson and Pat Brinkman the ten minute crank from bottom to surface was not such a daunting task and the video they recorded showed the pilot house, name, and tangled remains of the stern cabins. Persistence, technology, and luck paid off again in the continual search to unveil Lake Superior’s hidden history.